The “Moment #42” Nature Series mural is coming to life at Longwood University. A tree begins to breathe as the morning sunshine awakens the flowers along the #geometricnature trail inside Dorrill Dining Hall @longwooduniversity . A creative “Sunday Funday” begins in @farmvillevirginia with a cropped #wip view of the new “Nature Series” mural coming to life! 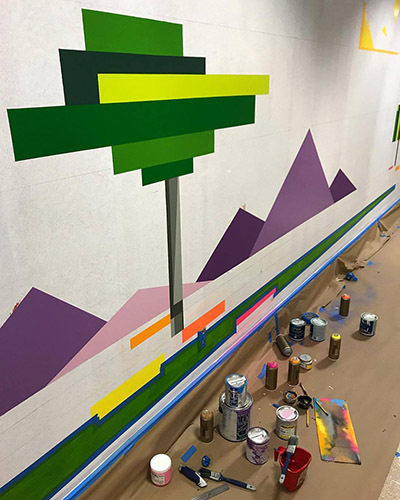 @montanacans | @goldenpaints | @liquitexofficial | @valsparpaint #longwooduniversity #montymontgomeryart #muralism #geometriclandscape #neonature #montanacans #geometricnature #neofuturism #montymontgomery #montyart #wip — with Montana Gold and Montana Cans (official) at Longwood University.